Yun-woo Kim works as a low level civil servant in a district office. Although he is thirty, he is still innocent for his age and has been on numerous unfruitful blind dates in search of a suitable wife. 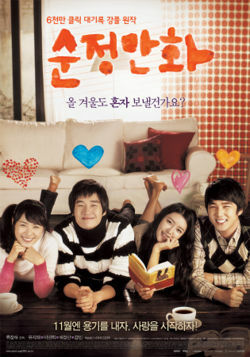 After moving to a new place, he runs runs into Soo-yong Han, a high school student who lives downstairs. Soo-young Han is a cheerful and eccentric eighteen-year-old who lives with her mother that acts like a princess. Meanwhile, Sook Kang has just started to work at the district office straight after graduating from high school and falls head over heels for Ha-kyuing Kwon, a melancolic woman who always smokes in the same spot, becuase of her beautiful smile. Ha-kyung is still holding onto an old flame and keeps on looking for traces of that love every day. Sook Kang continues to keep wooing her, irregardless of her living in the past. Can their futures lead to a happy ending?